LIFE OF A COMPANY: PART II --- GOING PUBLIC! Today, we continue our series on the life of a company. Part 1 discussed the decisions to be made when a company is first forming, discussing advantages and disadvantages of the various types of limited liability entities and the important step of choosing a name for the entity. Now, we will skip ahead, to a time in the company’s life when it is growing and prosperous. It has decided to take the step of “going public.” That is, it will offer its shares for sale on a securities exchange such as the N.Y. Stock Exchange (NYSE) or NASDAQ. Taking this step can generate substantial proceeds for a company and provide it with opportunities for growth. It also provides access to the public market for future financings, better positions the company to obtain financing in the public debt markets, and usually benefits investors who see an increased valuation of their investment. Finally, going public can provide comfort for suppliers, customers and other investors due to the need for increased transparency and the rigorous due diligence and other processes required. A company wishing to offer shares on the stock exchange must be a corporation with a substantial number of authorized shares. While it is likely that a company that initially formed as a limited liability company (LLC) may have already taken the steps needed to become a corporation prior to this point; if it has not, it will need to become a corporation (usually domiciled in Delaware). In the majority of states, this will mean filing a Certificate of Conversion, which enables the company to continue its existence, while changing its entity type from an LLC to a Delaware corporation. However, not all states have statutes permitting this type of conversion. Delaware does allow an LLC to convert in this manner as long as that change is also permitted by the entity’s home state. To convert the entity, a plan of conversion is drafted to govern how the change will occur and a Certificate of Conversion, accompanied by a Certificate of Incorporation, is filed to effect the change. If the original LLC was registered to do business in other states besides its home state, filings must be made there, as well. Sometimes the company is allowed to amend its registration; other times the converted LLC must withdraw and the corporation must register as a new entity. There are a number of states that do not yet allow for an LLC to convert to a corporation. In those cases, the following procedures are usually followed: a new corporation is formed in Delaware, a plan of merger is drawn up to merge the existing LLC into the Delaware corporation and merger certificates are then filed in both states to effect the merger, ending the existence of the LLC. Even if the entity is already a corporation prior to the decision to go public, it is likely it will need to file a Certificate of Amendment in order to increase its authorized shares. When considering stock structure, it is very important to consult with an attorney. Different classes of shares, having different rights, are required and it is very important that the designation of the shares is done correctly to ensure there is no loss of control over the management of the company. A large amount of non-voting stock will need to be offered at the IPO and a smaller amount of voting stock will be retained by the current shareholders. The company should be aware that the increase in shares will lead to an increase in annual franchise tax due to Delaware each year, as the tax is based on the number of authorized shares. It is likely the company will need to go to quarterly filing, which is required whenever the franchise tax due annually is over $5,000. 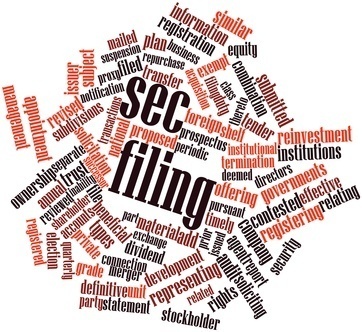 In addition to changes to the structure, a company will also need to file Form S-1 with the Securities and Exchange Commission to register its name. There are a number of due diligence documents that accompany this form, such as financial records, corporate governance documents, etc. Once a company has successfully registered its name, it can list its shares on a public exchange, such as NYSE or NASDAQ. With exciting new public offerings of shares making headlines so frequently today, many start-up companies dream of the day they, too, can take this step. When it makes sense from a business perspective to do so, there are many things to consider and registrations on the public record to be made, both before the public offering and subsequently.